OK, so pretty much an overwhelming day that ended with dinner hosted by His Royal Highness Shaikh Salman Bin Hamad Bin Isa Al-Khalifa at one of his palaces. To the left is a picture I took as he made the rounds greetings all of the international guests who were invited about 100 in total. 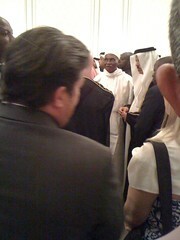 This picture was taken moments before he made his way to me and yes….I have shook the hand of royalty….pretty cool! What was even cooler was the speech he gave to the participants of The Education Project (Twitter Tag: #TEP09) talking about what is needed in education. You can read the full report in the Gulf Daily News. 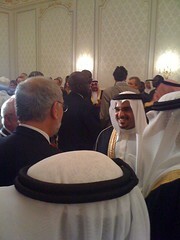 The Crown Prince talked about the importance of educating the next generation. In a part of the world where close to 50% of the population is under the age of 30, education is indeed an issue. The Crown Prince said too many young people are entering the jobs market without the skills they needed for the post-industrial, knowledge-based economies. It was great to hear the Crown Prince of an oil producing nation talk about a knowledge-based economy and asked the participants to use this time together to be innovative. I totally get that, but what I heard more and what came through even louder was the fear of not knowing what to do with it. There are many successful online universities. Now does it replace a great face to face teacher? No, but if you are in a country that has little to no post secondary options for students, or universities that can not or do not have the courses/degrees needed to support your local economy, online is a better choice than nothing. I tried to encourage them to stop “Thinking Globally and Acting Locally” and to “Think Locally and Act Globally”. I’ll take Bahrain for an example as it was the one that came up yesterday. Countries need to start understanding how the Internet, and the content and teaching that can take place there, can be incorporated into their local universities to enhance learning and create opportunities locally. Let’s say for example that Bahrain can not find enough engineers to sustain it’s rapid growth and development. Instead of trying to recreate a college of engineering, could they not go out in search of a top engineering school to partner with, and create an online college for those who are interested? Singapore University has a college of engineering that is in the top 100 of all colleges in the world. What if Bahrain could form a partnership with the Singapore College of Engineering to use what they do really well to affect change locally. Think of what you need locally. Find ways to use globalization to bring those skills and education to your community. Of course this is a mind shift for many people, communities, and nations. To think we don’t have to have the best this or that….we just need to know where to find it, and how to use it successfully. I’m hoping that day two of the conference will inspire more out of the box solutions for developing nations who are struggling with educational needs. We’re in the early years of online learning, but in rural communiteis whether in the US, Pakistan, Senegal (Who’s President I met yesterday as well, pictured to the left), or a host of other nations, if the option is either online learning, or no learning why wouldn’t you invest in online learning? It’s only going to get better and in the mean time you’re educating those that never had an opportunity to learn before. Trying to fix the old system isn’t going to work, we need a whole new systems and I strongly believe it’s going to be the developing world where these systems will be tried, tested, and implemented first (See Disrupting Class). There is already wireless cell signals in the middle of the Congo now we just need to figure out how to get the power of the Internet into the hands of the children there. If anyone has ideas or the money to support such an adventure….please let me know…..and count me in! I agree that teaching is more than putting content online, yet it seems that more and more schools are leaning this way to prepare for potential closures due to H1N1. F2F is priceless, especially for students that become energized by social interaction and acknowledgement from their respected peers and educators. There has to be some balance, but with the world of technology moving so fast, we might tip the scale in the wrong direction. This is where we lose the old school teachers in the tech debate. They are not afraid of losing control, but of technology becoming the educator. Education equals more than content; it blossoms with the proper delivery. And that’s been the issue with technology in education from the beginning. You can not take what you do in the classroom and just do the same online. We need to reteach teachers what this means. Do we do this in pre-service education? Do we take time to do this in our schools? The conversations I’m having here with Ministers of Education is that the found out the hard way that online learning is way different than the in class teaching, yet we’re not helping them to rethink what teaching and learning looks like online. Jeff I think your observations are interesting, but one thing you need to be aware of is that in many places — the GCC for sure students do not have the foundations to be life long learners. I just returned to the States after teaching for two years in the GCC at the college level. My sons attended the best American curriculum HS in the country. In general the students both at my level and my sons level approached education from the point of view of just getting a piece of paper which allowed them to get more money from the government. They really needed the spark of learning to be lit and then fanned. This is something which requires a relationship and trust to develop between the teacher and the student. What will be interesting is how this part of on line education will develop. The second point I want to make is that because students were only after the “piece of paper” and they had no problem justifying cheating the Ministry of Education had a problem with online education. This is points to another area that online education will need to solve in order to be effective in the GCC as a tool to really educate. The theme of culture was a revolving one throughout the conference. That culture has much to do with the education a community expects. Could you take Finland’s high teacher expectations and import those into the GCC? Probably not because of the culture differences between those two cultures. This is a larger issue than just education as you point out and there was also push back from some at the conference that they are feeling “colonized” by universities and a western way of educating people. Again culture differences will need to be discussed and accepted before anything will be able to move forward. Wow! I love the thoughts and ideas you have presented here. It is great food for thought as we are all trying to “rethink” what the schools of the future should be…what they should “look like.” As we design education for the future, we definitely need to be thinking outside of the box, as you suggested. I am very involved in global initiatives, and I really like your comment on “Think locally, act globally,” reversing the more common order of the words. And, having worked in Tanzania with students and teachers there, I understand much of what you are “saying’ about the value of using the technology to take the education and the educators to the students when there are no options in their area. I look forward to your reflection on the remainder of your conference. I was unable to attend this year, but am hopeful I will be invited again next year. Wishing all of the participants a safe journey back to their homes! Motivates me to be a better “online educator”! Moving towards embracing technology and understanding that “knowledge workers” can be created online as well as in classrooms.